This post will announce the relaunch of https://steemgigs.org and explain some of the core elements of our ecosystem. It will touch on its history and discuss its current state. Then, it will highlight the role of teardrops tokens within the steemgigs ecosystem. "Steemgigs.org" is dedicated to my mum who passed away in Nov 2017. It is a gift to mama Earth and by its means we will build many noble dreams. The first successful SteemGig happened more than 2 years ago. SteemGigs has a community on discord with more than 5000 steemians. Steemgigs.org Alpha began some 9 months ago. Steemgigs.org is a freelancing marketplace built around the steem protocol. More recently, @acidyo brought a similar topic up in this post; Why VoiceOverPete should join Steem! 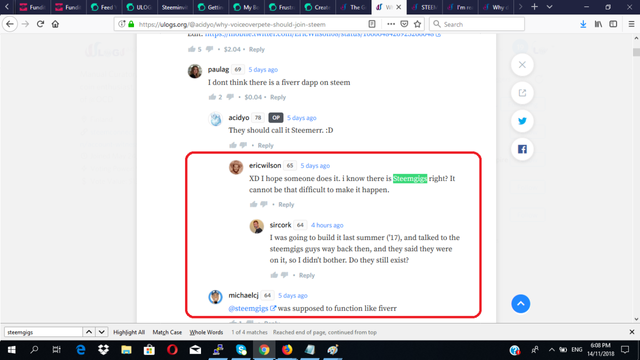 Looking at the comment section of that post, you will notice that steemians still remembered SteemGigs. Here is some passionate video(s) evidence of interest in steemgigs, from the past. Finally, we are announcing the relaunch of steemgigs.org for use. Today, March 23, 2019. We will still maintain 'alpha status' in this release, then continue further development on the go. The current steemgigs.org version has evolved tangibly from its former state. We admit that development has been slow but this move to relaunch it can be considered a milestone because it constitutes a spark. From henceforth, we will only move ahead. In this version, the main aim was to display the expanse of our vision to every visitor, this includes users, potential investors, advisors, venture capitalists, web developers etc. This means that even where some features or functionalities have not been entirely built, the framework for these features have been added to the website with a 'coming soon' status. Each visitor to 'https://steemgigs.org' should be able to attain full insight into the expanse of our vision, right from our landing page. Whether you an expert or non-expert, you can offer a service in exchange for STEEM, STEEM Dollars, Steem Power or 'for free'. SteemGigs has an un(dis)talented paradigm. This means that on SteemGigs, everyone has something to offer. We maintain a repository of gigs (services) offered by 'a community of reputable great minds'. We have a vibrant community, heartily seeking to help you 'build your dream'. We don't only offer you talents; we offer you a like-mind, a SteemGigger, a dream-builder, a brother. Visit https://steemgigs.org, to locate that special someone. "Do the dreaming, leave 'the building' to us". Where you can't find the 'exact gig' that fits your need, you can create a 'custom request' or 'a microtask request' and we will actively seek out reputable great minds from our community who can help. On STEEMGIGS, content is queen. A core aspect of SteemGigs is our knowledge-bank, a repository of niche-based information borne out of experience. We welcome content-contributions for our users. This content ranks in the search engines and is published to the steem blockchain, before a large community. Where your content attracts likes (upvotes), you earn in Steem or Steem Dollars and in the near future, the teardrops smart media tokens. You have successfully reached STEEMGIGS, a revolutionary freelance services marketplace & social network connected to a decentralized steem blockchain, with the power of Fiverr, Upwork & Freelancer combined. SteemGigs removes all barriers to entry in relation to 'building a dream', by implementing an 'untalented & community paradigm', in association with a token economy. Whether it is an innovation, vision, enterprise or business and it is yours, we consider it 'a dream' and it is about 'your dream' for us. As a result, we will go beyond just getting you the right freelance services. We want to play an active role in historical history as part of your noble dream. On STEEMGIGS, everyone has something to offer. We have a token economy that allows users to earn for their content, in addition to 'services rendered'. (This applies to both clients and freelancers). No third-parties merchants and its associated fees. No censorship. (meaning your gigs can't be deleted). We have an established and reputable community. We know our community and it is an actual community. You can find free GIGS. You can earn from doing microtasks. We are affiliated to a larger community of steemit.com users. You can pay/earn for services for/with SBD, Steem, Steem Power or 'via a steem upvote'. We have a knowledge-bank, that maintains a repository of expert-knowledge, borne out of real-life experiences. If you are a client, you get more than a freelancer. You get a like-mind, a reputable great mind, a dream-builder and brother. You can have a stake in the company by virtue of the teardrops SMT. Every participant of our ecosystem will eventually become a 'dream-builder' (SteemGigger), building their dreams and those of others. On steemgigs.org, everyone will have something to offer. Yes, even non-experts will be able to offer gigs, for free or at a lower cost, known to clients. This way they can offer gigs, hone their expertise in the process, gain confidence, all while attaining higher levels of expertise by availing of expert niche-based knowledge from our knowledge-bank and consultation from veteran members of SteemGigs BROPRO services. All exclusive UI-perks on SteemGigs will be available to only certified uloggers. However, every(any)one can become 'certified'. All video tutorials across SteemGigs will only be done by certified uloggers. Most algorithms e.g related to profile-suggestions etc will be inclined towards 'the certified'. SteemGigs will only feature and recommend 'the certified'. Other Special Highlights From The Current Steemgigs Version. We also began the framework that will integrate 'a microtasks economy' into SteemGigs, starting with a basic 'create a microtask' post-editor and a 'microtasks display column' on our homepage. Besides, another core aspect of our model is 'steem growth'. To this effect, we must be able to unveil 'the wealth in our steem community of reputable great minds' and organically involve every steemian in the steemgigs.org ecosystem, whether they are active on steemit.com or not. 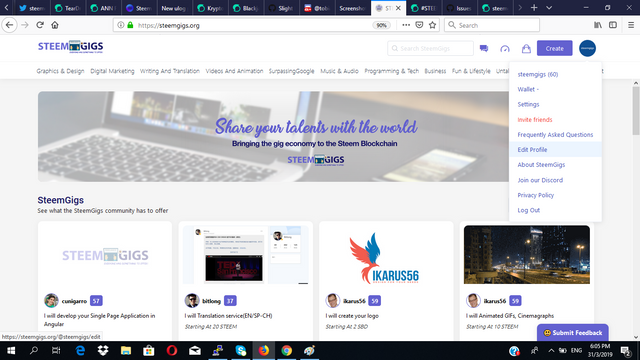 Thus, we are building our search engine mechanism to be capable of scanning the entire steem blockchain for potential talents/un(dis)talents. Unlike conventional freelancing service marketplaces, SteemGigs is very content-based. Recall, the 'surpassinggoogle paradigm' mentioned earlier? 'On Steemgigs, content is queen'. We would seek to serve the search engines incessantly with our testimonials too, in full-blown testimonial posts that will be displayed on a designated column on our homepage. Where @airmatti decides, he can decide to document his entire 'delivery process' using a series of testimonials, maintaining transparency, opening himself to more clients/opportunities and most of all, improving his overall 'real reputation'. Enhance the 'search by profile' aspect of our search portal. Add a basic BROPRO page. Add the teardrops tokens wallet. Enhance URL-preview for social shares. Add steemconnect and keychain 'wallet transfer' capabilities. Still in the near term, we will work on a raising a budget to begin stage-2 of our development, during which we will begin to build core features and functionalities, to open up steemgigs.org to the world as a whole. In a coming release, we will begin to add a 'sign-up with email' option, to seamlessly onboard a mainstream audience onto the SteemGigs ecosystem, until they get their steem account. We will also look to add features like internal messaging, optional escrow, personalized feeds etc. Some of our core features will have to wait till the SMT protocols begins. However, we will continue to integrate the teardrops tokens into our ecosystem in the near term, so that it begins to be usable. As SMT approaches, we will begin to establish a solid team and a respective 'team announcement' will follow'. One thing is for sure, on steemgigs.org we will innovate dynamically and incessantly to make sure we become a 'theater for dream-building and a home for every(any)one'. We want to play an active role in historical history as part of every noble dream. Note that steemgigs.org is directly linked to two other steem-interfaces under the umbrella of the teardrops SMT ecosystem, namely 'https://ulogs.org' and '@macrohard'. Being that the teardrops SMT will power all three interfaces, we will be able to relay a more established 'long term plans', when we have become abreast with the dynamics of the SMT protocol. We will look to make an announcement related to our 'long term plans' in the coming months. In the meantime, please go through a series of articles here to gain insight into the concreteness and evolution of our 'grand picture'. Thank you for this detailed post. It contains the history down to the current state of the Steemgigs project. The project excites me, and it’s great to see the relaunch of the Steemgigs project. I have known Steemgigs since its inception on the Blockchain. Although I have never made any gig post; I used to read a few of the post submitted via the platform, and It was cool. The update is huge. You must have put a lot of effort, resources and time to achieve this big. The idea for expansion is excellent and looks like the project is about to surpass Google. I hope more people use the opportunities attached to the project. 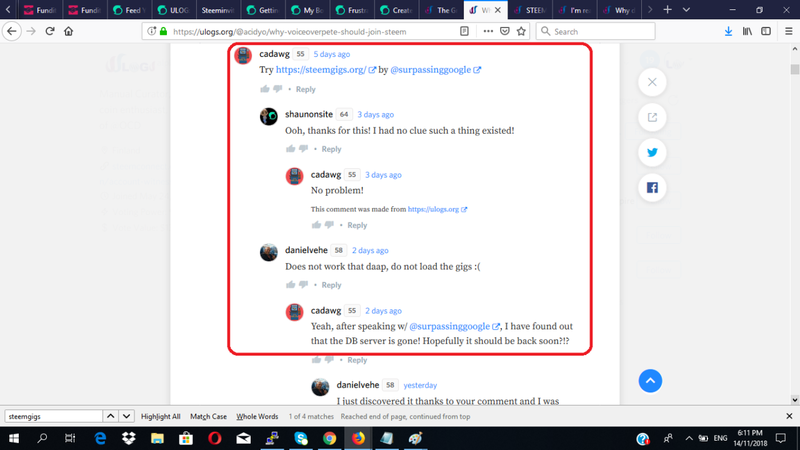 Thank you for sharing this great information with the Steem community. I wish you success as you continue with the implementation of your plans. Thank you alot bro for all the consistent love. I sent you some 50 teardrops tokens. You can find these tokens on steem-engine.com or on the keychain browser extension. The teardrops token will be used across steemgigs.org, ulogs.org and @macrohard stake-able as 'influence' and other utilities. Kindly consider submitting your best email in this google form (https://goo.gl/forms/7NxDYt4HX5GAgkae2) as we will need it, to pass across information related to the teardrops smt ecosystem and 'getting certified'. 'The certified' users have a large role to play in the teardrops smt ecosystem. I am good, thank you! Thanks for the information. I will create as soon as I can. Please make Steemgigs work already! Seems like a really fancy interface that doesn't do a whole lot. 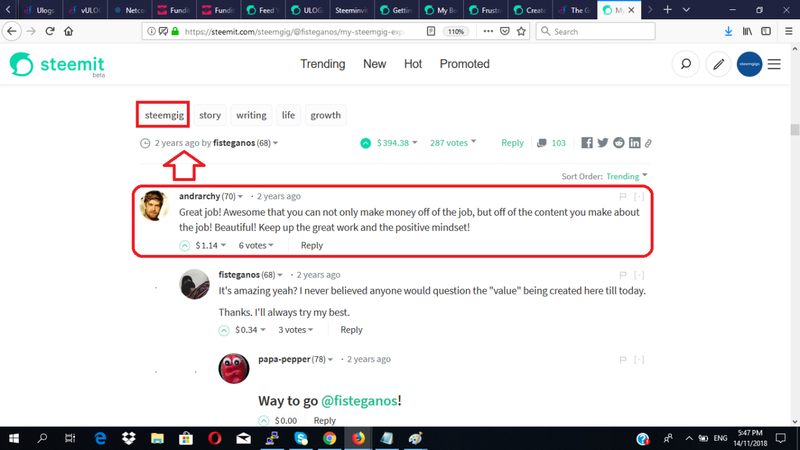 Can't I just hire and be hired by posting on Steemit.com? Why does it need to be a "revolution" to have a gig marketplace? I've hired several people, some many times, just by using my own blog. I don't get the point of all this. I'd rather see something like Craigslist: Simple and to the point. Which will be the total total supply of Tearsdrops? I would love to see steemgigs live as fast as possible. We can do a lot of things there! Yes bro. Alot of things. Teardrops is on steem-engine for now and will find utility before it becomes fully live on smt. It will use a pool and will be used across all three interfaces, steemgigs.org, ulogs.org and macrohard also as stake or influence. My plan is to go to next phase of development really fast on steemgigs.org, so my short term plan for the end of March is to, publish a paper for each of the other two platforms and a mini paper for the teardrops smt landing page. 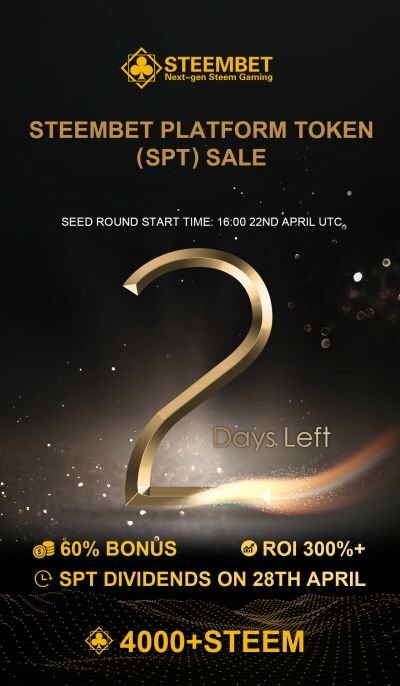 Thereafter, see if i can raise some money via the token for stage two of development, else i will keep on going with my usually task requests and bounty. But it will be all work in the coming days. The plans are really beautiful. Besides gigs, there will be https://steemgigs.org/surpassing-google, a bropro page which will allow users who want to offer consultancy e.g video calls, audio calls etc to accept the teardrops tokens and there is also https://steemgigs.org/create_microtasks to explore 'pay with vote' and one special part is the 'search' engine. We want to be able to scan the steem blockchain as a whole. so where you can't find a gig and can't do a custom request, you can find potential freelancers by 'searching by user'. We are adding new tabs to our 'profile edits' so users can at least create an indepth profile on steemgigs like on linkedin, so users can still search potential freelancers whether they have gigs or not. I am currently writing the paper for ulogs.org, then one for macrohard and the landing page for teardrops token, with a mini colorless paper is being drafted. I hoping these things are complete by March 31 st, then it will be non-stop work going forward. I had a slow journey cos i started out on steem as non-tech savvy and had to learn a lot. i also had many falls. I am looking for devs as well. i usually have many open utopian-based tasks and they normally have a steem bounty. in the long run, the teardrops token will be used to incentivize code contribution as well. Thank you for so much inspiration. The plans for the token is great really. Not like i am experienced but i have learned alot and plan is one token across three steem-based interfaces, all interfaces playing out a 'mining the human' model (proof of tears), a slight shift away from 'proof of brain'. Also the tokens, you influence on one platform with say teardrops power will not have effect on the other two platforms. You will need additional teardrops power on the other platforms. Alot of work really. Stay awesome. Same here. Sometimes that is the missing piece enroute dream-building and not 'talent', "brother talent". Hoping to unveil the beauty of steem in this regard. Thank you alot for being here. Dear @surpassinggoigle i have a big idea! how can i share with you . Plz give your mail. PHEW, that was a long post.. good stuff tho. My I ask why the use of a new token and not just use Steem as the token on the platform? Thank you for reading through. Teardrops is an additional token and it is a steem-based token but conventional steem, sbd is main by default. One can use any of all these. Your steem wallet can hold many other tokens which are steem-based. steem-based tokens are quite new but steemit inc has its own plans called SMT. teardrops is an eventual SMT but built on steem-engine.com for now till smt arrives. I am going to take a look at this platform. Hey I got your email! Happy to hear all this. Cant wait to see steemgigs fully back again. Very encouraging. Yes it will be transformational. Sounds fairly interesting! How does it differ from bounty0x? I wasn't in the Steem ecosystem 2 years back, so not heard of Steemgig. But sure am going to check things out. wow this like fiverr on steem ! even better as job requester can chk out the steem profile of the one providing the service. probably we can put up some custom request. btw when i did a search for graphic, on the overview search result possible to add the review (count + rating) plus the portfolio count of completed task ? In many ways better, especially as development takes off and it is attaining completion. I'm with it, make it happen and ill use it. I already try to get people to do stuff and accept Steem etc. Wooo! Awesome. We will make happen. I expect alot of evolution from where it currently is in the coming weeks. Awesome!!!!! To be honest with you, I'm captivated to join #steemgigs. I love a lively community and I can see this is a great option for me. @surpassinggoogle, Steemgigs now hold fresh and renewed essence and i am really excited to explore this Ecosystem. And your consistent efforts to make this Ecosystem better is really appreciable and motivating too. Much growth ahead. Stay blessed and blessings of light is with you. @tellyupdates, Greetings for the day. It's reflecting as you are new on this platform. And sharing links and asking for the upvotes is not the right way. Kindly, provide organic comment regarding the blog and in this way you will gain more exposure and recognition. Sharing links can face the flags which will reduce your payout and reputation. I want to wish you great growth on this platform and stay blessed. Congratulations @Surpassinggoogle for this feat espcially as #steem turns 3. It's strategic that @Steemgigs will build and launch many entrepreneurs.